Developed by Sherrill Brown and Susan Gassett for Maine Memory Network. Full exhibit is here. Charles Cole was 18 when he signed up for 9 months in August 1862. He joined the 25th Maine Volunteer Infantry as did many of the men from Sebago who enlisted then. Correspondence began soon after Charles left for Camp Abraham Lincoln in Cape ElizabethLetters written to Charles by his father Benjamin, sister Ella and brother Horatio, as well as ones that he wrote to his family have been preserved. They demonstrate how much his family missed him and feared for his wellbeing, even though his regiment never saw battle. He was stationed in Arlington Heights guarding the bridge over the Potomac River. 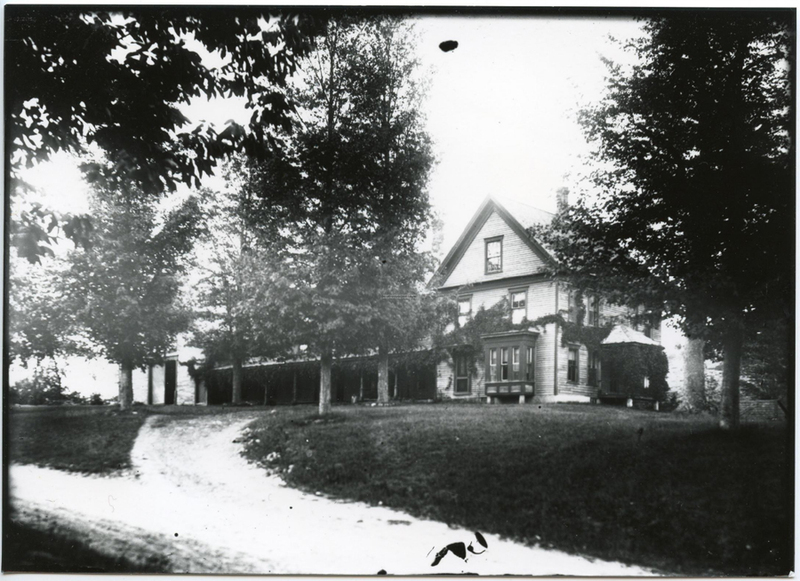 William Haley Jr. had a farm in the Convene section of Sebago. Married with four children, he was 38 when he enlisted in December 1863 as a private in Co. I, 30th Maine Volunteer Infantry. He served in the Louisiana campaign on the Red River expedition, where he became ill and was sent home to the hospital at Camp Keyes, in Augusta. The Haley Family letters in our collection begin in August of 1864 when William Haley was in Augusta waiting to return to his regiment. While he was away, his wife, Miriam, managed the farm and took care of the children. Written by William, Miriam and their oldest daughter Elzira, the letters offer an intimate view of their daily lives. As in countless small towns across the north, Sebago residents answered President Lincoln's call to take arms and fight to preserve the union. When the war was not over in six months as many had expected, more volunteers were needed and the townspeople voted to pay a bounty to Sebago residents who enlisted. Each town was assigned a quota. A bounty of $100 encouraged men to enlist. Nathan Wight, town clerk of Sebago, sent a letter to John L Hodsdon, Maine's adjutant general, to tell him that there were irregularities in the draft that had just been held. He requested that Hodsdon reply immediately because the men would be leaving for Portland the next week. 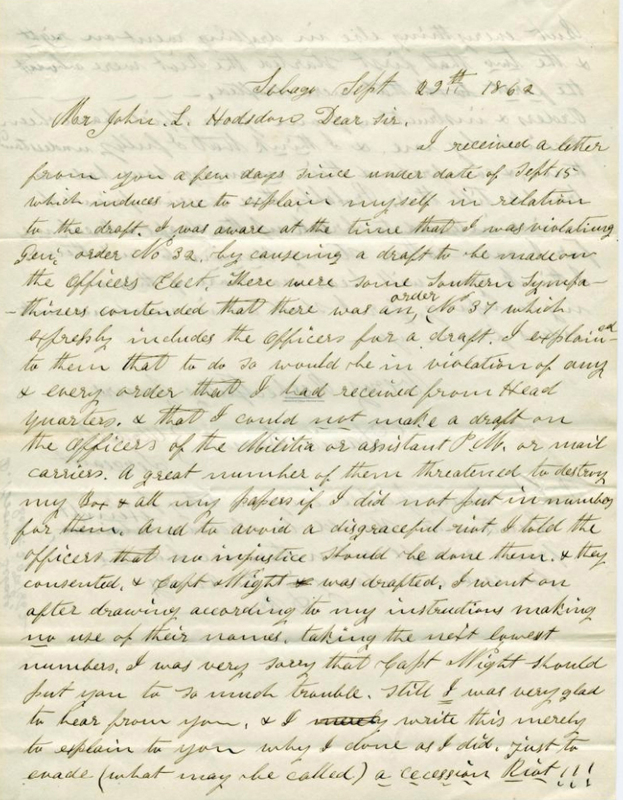 Hodsdon in turn wrote to David Brown, the orderly sergeant who conducted the draft. Brown explained to Hodsdon why he made it seem like he was drafting the officers elect, the stagecoach driver and the postmaster of Sebago. Horace Kollock of Saccarappa (Westbrook) was a high school student for most of the war, but he was eager to join the fight. 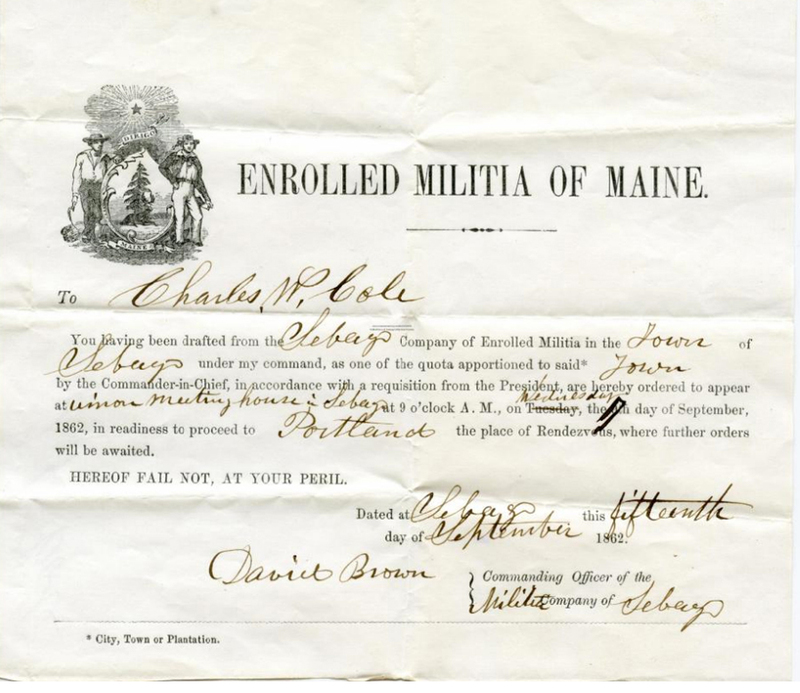 He wrote to his cousin John Bickford, who lived in the Mud City section of Sebago, about his plans to join his father in the 30th Maine Infantry as soon as he finished his school exams. His father had arranged for him to be a captain's clerk. 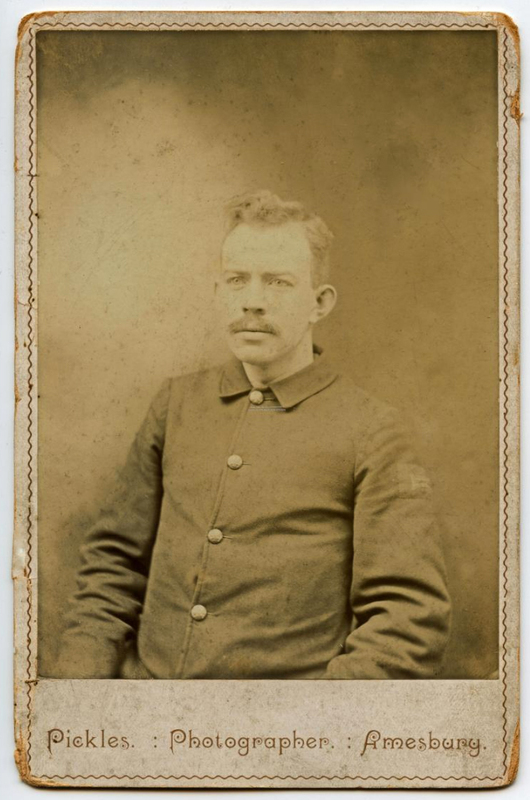 Walter Rounds, born in Sebago and raised in the neighboring town of Baldwin, enlisted at age 19 and was mustered into the 17th Maine Infantry. As was true of all soldiers, he loved getting letters from home and especially from his cousin Abbie Rounds. Whether he had a special fondness for Abbie before he went off to war, or it grew with time, it becomes evident in his letters. 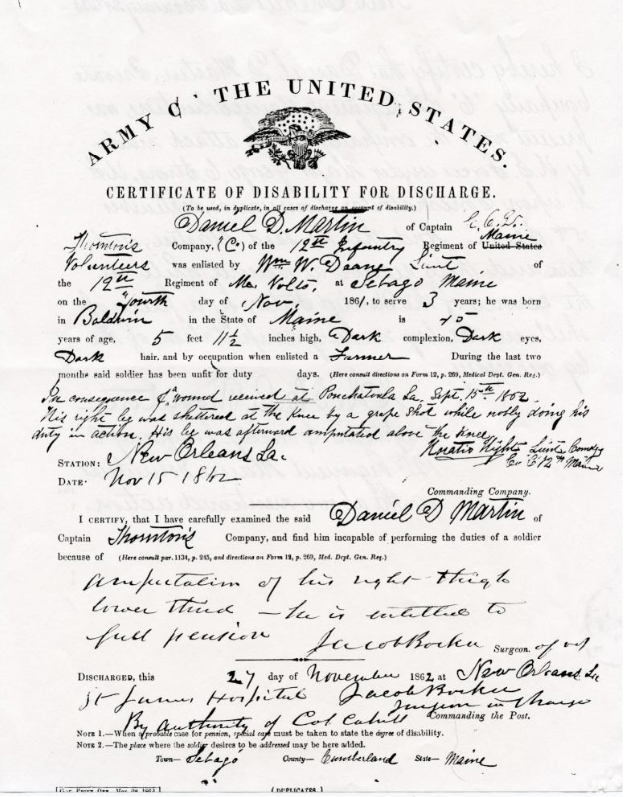 He was wounded at the Battle of the Wilderness and sent home on furlough. Before leaving the hospital in Augusta, he writes to Abbie that he is sending her a ring and wants her to wear it and be reminded of him. All of the letters that were saved were written by Sergeant Rounds to Abbie, who in the end married someone else. of Sebago who went to war.